The Festival of British Eventing at Gatcombe Park, Badminton Horse Trials, Blenheim International Horse Trials and Hartpury Horse Trials. Each of the three disciplines is designed to test the horses ability - dressage shows how trainable the horse is and its basic paces in walk, trot and canter. The cross country tests stamina, speed, jumping and bravery while the show jumping shows athleticism, control and accuracy. The sport is rather like the pentathlon in that it combines different disciplines in one competition and is run on a cumulative penalty basis. The competitor with least penalties at the end is the winner. This renowned event takes place at Gatcombe Park, spectacular home of the Princess Royal and her family and incorporates the British Open, Intermediate and Novice Championships. The Festival of British Eventing – the perfect country weekend. (September 13th to 15th 2019 ). The Festival takes place in the beautiful surroundings of Gatcombe Park, home of HRH the Princess Royal which is situated a few miles from the old village of Minchinhampton and close to the Gloucestershire market towns of Tetbury, Cirencester and Stroud. This year sees the event being run for the 25th time. The Cross Country course utilises a different area of the Gatcombe Park Estate to that used by the Magic Millions Festival of British Eventing, which takes place in early August. The event starts at 08.30 hrs on Saturday & Sunday. Dressage, show jumping and cross-country phases run throughout. The event attracts many interesting shops, which will include the Gatcombe Collection. There are various catering facilities available to spectators. At various times during both Saturday and Sunday HRH The Princess Royal will present prizes. Gatcombe Park is situated at Hampton Fields, mid-way between Minchinhampton and Avening; the event will be signposted from both directions. Spectator admission is £6 for a car and occupants and £4 for a programme. Full information about directions accommodation, timetable and all entries are contained on this web site. The event gets underway with the Dubarry Burghley Young Event Horse Qualifiers on Wednesday before moving onto the Recover CCI1*, Magic CCI2* and Superflex CIC3* from Thursday. Enjoy shopping with a view at a variety of trade stands which overlook the International Outdoor Arena, home to the dressage and showjumping phases. Then catch all of the cross country action on Saturday with a shuttle bus service to Hartpury House bank, ensuring the best view of all three testing courses. 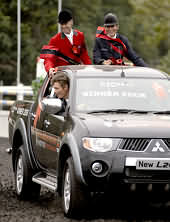 The Blenheim Palace International Horse Trials is one of the world's premier three star three day events. Set in the magnificent grounds of Blenheim Palace in Woodstock, Oxfordshire, and with the Palace as the backdrop for the main arena activities, the horse trial offers a fantastic opportunity to see some of the world's finest event riders and horses compete against one another in a truly spectacular location.